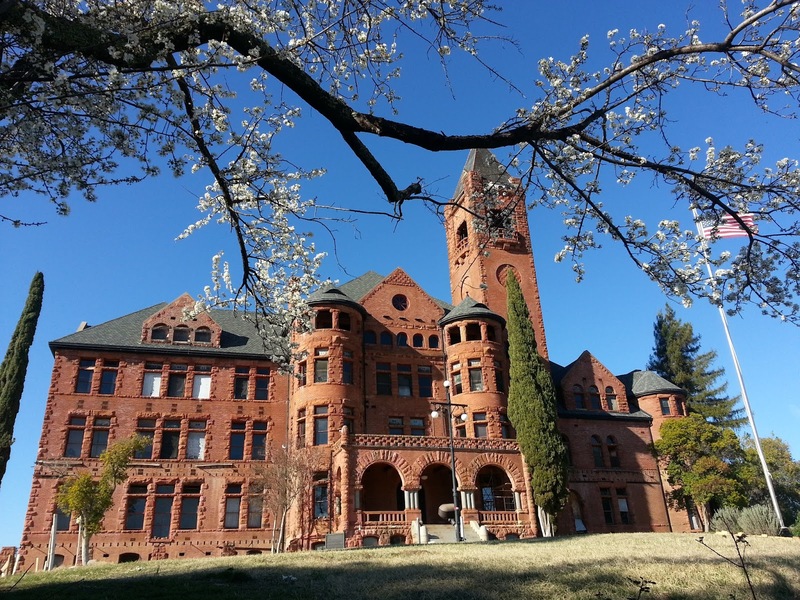 IONE, CA: Mark your calendar for April 1, the opening day of the Preston Castle Foundation’s 2017 Tour Season. 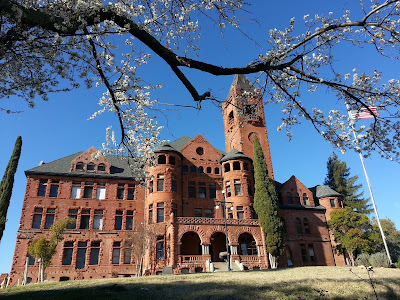 The majestic Preston Castle will be open for guided historical tours most Saturdays, from 10 am to 1 pm, April 1 through August 19. 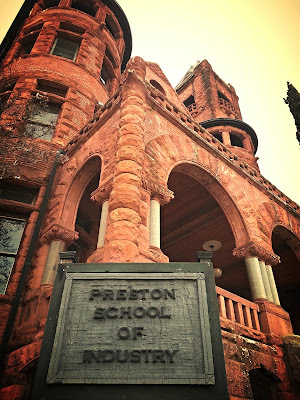 You will be guided by a trained docent through the first floor, second floor and basement and learn about the history of the Preston School of Industry. No reservations are necessary. The first tour goes out at 10:00 AM and depending on demand tours depart every 15-30 minutes. We also offer self-guided tours on May 13th and the second Tuesday of June, July, and August. These allow you to go through the Castle at your own pace, with information provided by posted descriptions. Docents will be available along the way to answer questions. Also available is a Virtual Tour for our mobility restricted guests which will take place on the accessible ground floor (basement) of the Castle. Tours are $15 for adults, $10 for children under 12 years of age, and free for children less than 5 years of age. Visit the website for more information and the specific dates that tours will be held. So plan a visit to Ione and enjoy a tour of the Castle, including a visit to the Farm Museum. 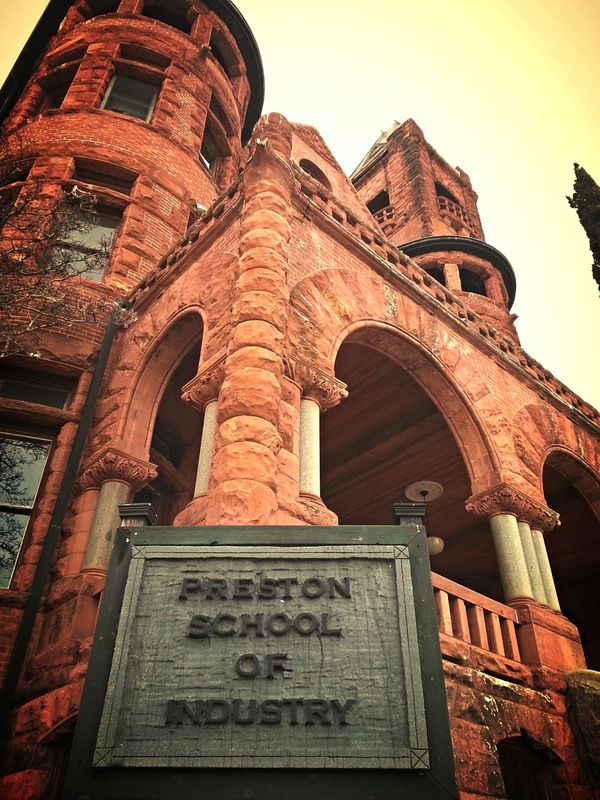 The Mission of the Preston Castle Foundation is to preserve, rehabilitate, and utilize the historic Preston Castle site. 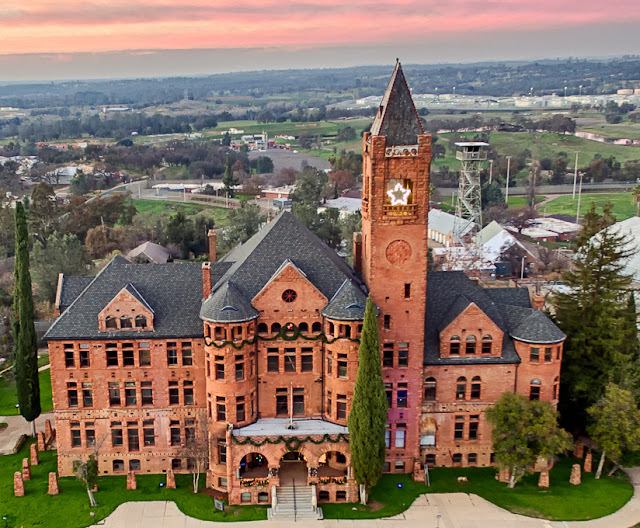 We are proud of the fact that the State of California has deeded the title for the Castle, four other buildings, and surrounding 13 acres of land, to the Preston Castle Foundation. This year we are working hard to install new gutters and downspouts to better protect the Castle from rain. To help raise money for this important project, the Foundation sponsors several fund raising events throughout the year. The first events for 2017 are the Flea Market on May 12 and 13, and the extremely popular Murder Mystery Dinner Party on June 23 and 24. Castle Tours are available on Saturdays, and select Tuesdays, during the warmer weather months. Check the website for specific dates. Help Save The Castle and learn more about the history, events, and tours by visiting www.prestoncastle.com. All contributions are tax deductible. WILLOW SPRINGS SCHOOLHOUSE DINNER FUNDRAISER - Sat April 8 at the Amador County Fairgrounds, Pokerville Hall in Plymouth. Prime rib/chicken piccata dinner. Cocktails at 5:30; dinner at 6:30. Emcee: Jim Crandell of Fox 40. Tickets are $40 each or $280 for a table of 8, which includes a bottle of wine. Emcee: Jim Crandell of Fox 40. For more information call Kathy at 209-245-4385 or Judy at 209-245-3664. Can’t attend? 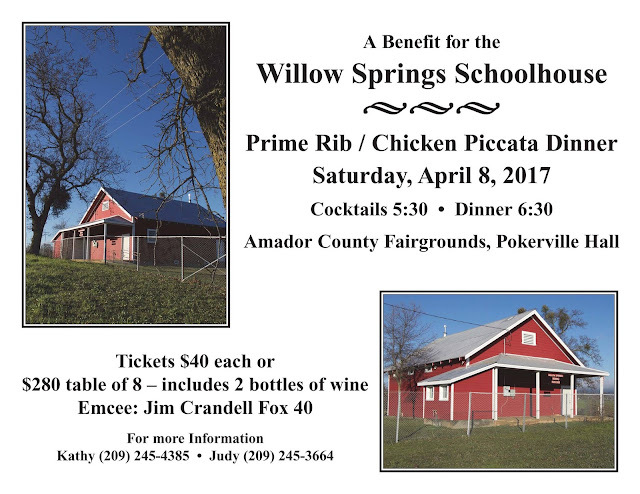 You can give to the Willow Springs Schoolhouse through the Amador Community Foundation at: http://amadorcommunityfoundation.org/impact/historic-sites/, or contact Kathleen Harmon at 209-223-2148 for more information. You can also mail your check to Amador Community Foundation, ℅ Willow Springs Restoration, P.O. Box 1154, Jackson, CA, 95642. 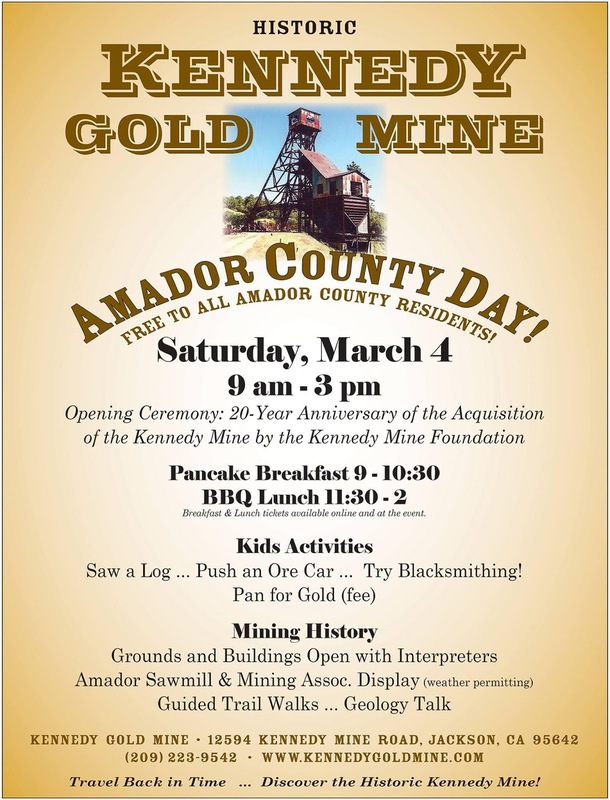 Tax ID # 68-0447992.
brings Gold Rush history alive in charming, historic Amador County. 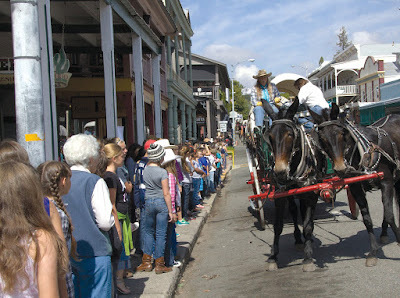 An authentic wagon train of 15 horse-drawn covered wagons will embark on a 4-day journey from Plymouth, CA, through the Highway 49 towns of Drytown, Amador City and Sutter Creek, to Jackson for a celebration of California’s pioneer heritage. The colorful Kit Carson Mountain Men will rendezvous for their fourth living history wagon train re-enactment through the Gold Country, when everyone is invited to visit with horse-men and -women at stops and encampments along the way. The public is invited to join the wagon train each afternoon and evening for barbecue dinners and casual entertainment. Admission is free to all events. 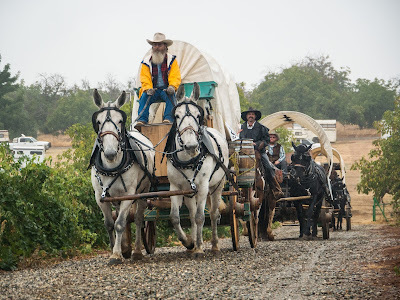 Thursday, April 27, the Wagon Train departs from the Amador County Fairgrounds in Plymouth for a loop through Shenandoah Valley, Amador County’s popular wine region. The Wagon Train will stop on Main Street Plymouth for a group photo commemorating the City of Plymouth’s Centennial Anniversary, visit Far Horizons RV Resort and Plymouth Elementary School, and then head back to the Fairgrounds for the night. 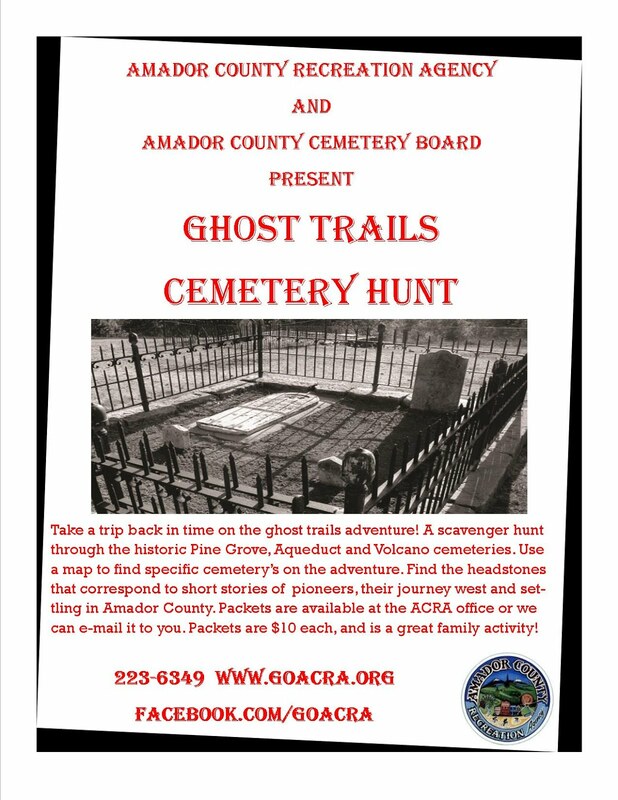 Friday, April 28, Old Highway 49 will become the Wagon Train trail, leading to stops in Amador City and Sutter Creek. 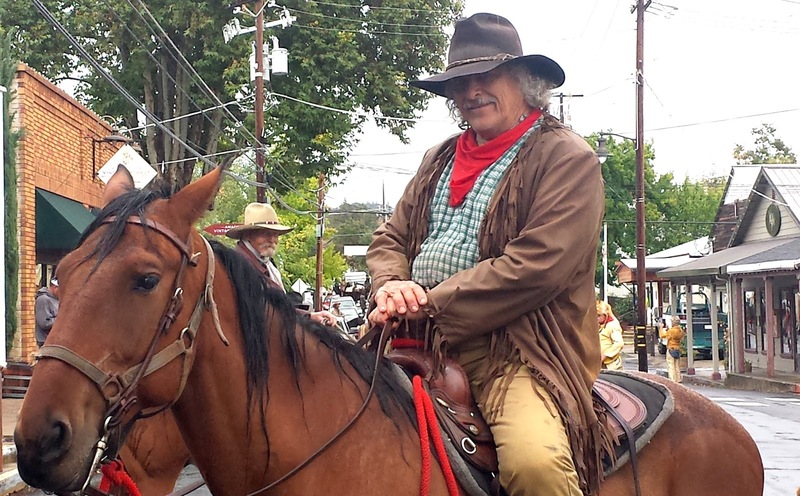 From Sutter Creek Main Street, the next stop will be the Italian Picnic Grounds on Hwy 49 for a sunset barbecue, music, square dancing and campfire. 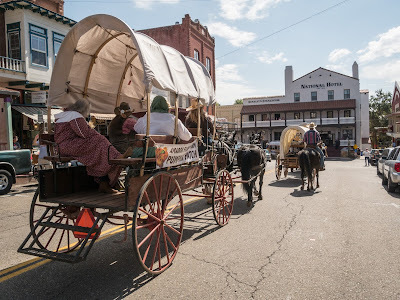 Saturday, April 29, the Wagon Train will visit Jackson Main Street around lunch time before camping at historic Kennedy Mine in Jackson, near the iconic Kennedy Tailing Wheels and the head frame of one the deepest gold mines in the world. All day (9 am – 5pm) the Kennedy Mine will be hosting “Days of 49 at the Kennedy Mine (enter from Hwy 49/88) with special activities for kids, gunslinger re-enactors, gold panning, mine tours and more. A BBQ lunch and ice cream sundaes will be available. 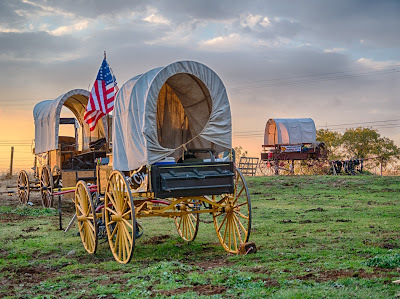 Saturday afternoon families can visit the wagon encampment (near the Kennedy Mine entrance on Jackson Gate Road), talk to the wagoneers and their horses, and soak up some authentic wagon train grub at an evening BBQ. During dinner and throughout the evening, enjoy a Gold Rush variety show on the Kennedy Mine Amphitheatre outdoor stage. Sunday, April 30, the Wagon Train returns to Main Street, Jackson, at 11 am with the entertaining Wagon Train Parade of horses, buggies, music and pioneer fun. The Kennedy Mine Foundation will offer a Miners’ Brunch for breakfast while you watch the parade. This free, community-wide celebration highlights the historic Hwy 49 Main Streets in Amador County, Amador County and Whitney Museums, the Kennedy Gold Mine and Kennedy Tailing Wheels, and Amador County's Pioneer Cemeteries. 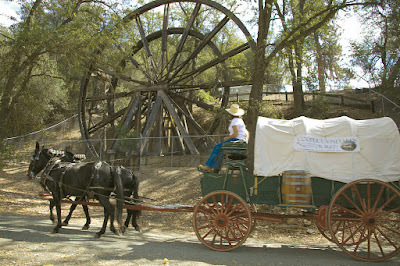 Updates, wagon train route and schedule details will be updated regularly at: www.VisitAmador.com. 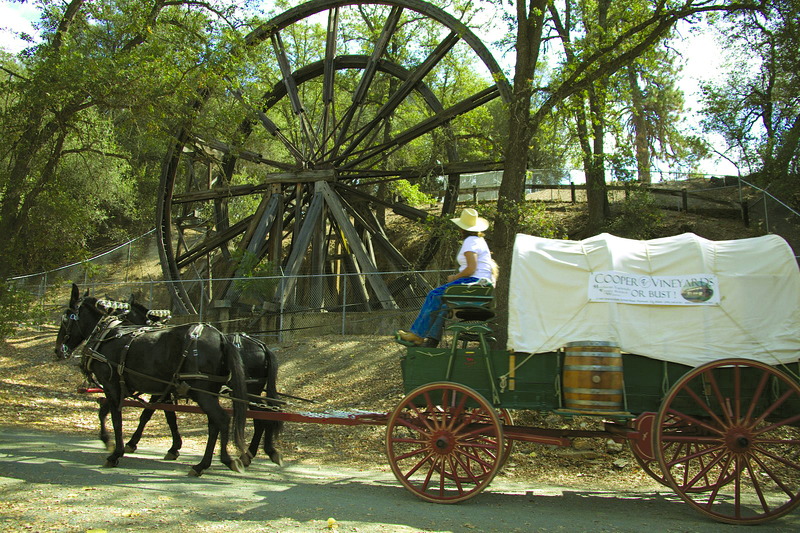 For information about participating in the Wagon Train, parade or camp activities, contact John Queirolo,916-965-1136. in Amador County’s Shenandoah Wine Country, outside of Plymouth. wagon drivers and their teams. and is known as the Days of 49 Wagon Train. producer of over $28 million in gold. where they are joined by other performers, riders and local historic groups. All are invited to celebrate Amador County’s heritage by joining us in the Kit Carson Mountain Men Wagon Train Parade held in Jackson, California, on Sunday, April 30th, 2017. The Kit Carson Mountain Men Wagon Train, with 20 covered wagons and wagon train outriders will be the finale of the parade. 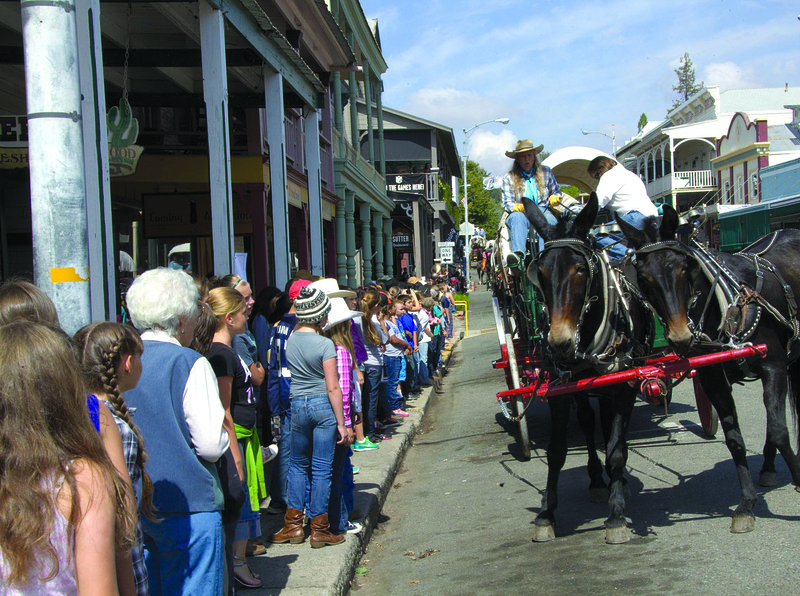 We encourage you to celebrate Amador County and its history with your parade entry! Historic groups, family groups, musicians and entertainers, walking or rolling entries...JOIN THE FUN AND STRUT YOUR STUFF! There is NO entry fee this year! If you or your group is interested in attending, please return the attached form by mail or email no later than MONDAY, April 24, 2017. Otherwise show-up the morning of the parade with a completed form, we should be able to fit you in. Your parade position numbers will be given when you show up the morning of the parade. Parade line up will begin at 10:30 a.m. April 30th, 2017. For information contact: Gale Fairbrother (209) 256-2556 or Dianne Oneto (916) 965-1136. Celebrate the completion of the first phase of “Save Our History,” a joint project of the Ledger-Dispatch and the Friends of the Amador County Library. The project involved raising money to digitize the Amador County Library’s microfilm archive of more than 150 years of the Ledger-Dispatch and other Amador County newspapers. This first phase celebrates the milestone of having a searchable, online archive (1855-2008) of the Ledger Dispatch–a boon to historians, local history buffs, and genealogists. The program is open to the public and will feature presentations, demonstrations, light refreshments, and a no-host bar. 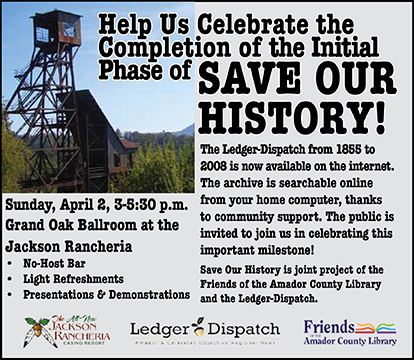 Sponsored by the Ledger-Dispatch, the Jackson Rancheria and the Friends of the Amador County Library. For more information, contact FACL President Rick Sprenkel at 209.296.2771. The Knight Foundry in Sutter Creek is America’s last water-powered foundry and machine shop and a premier relic of Mother Lode gold mining history. 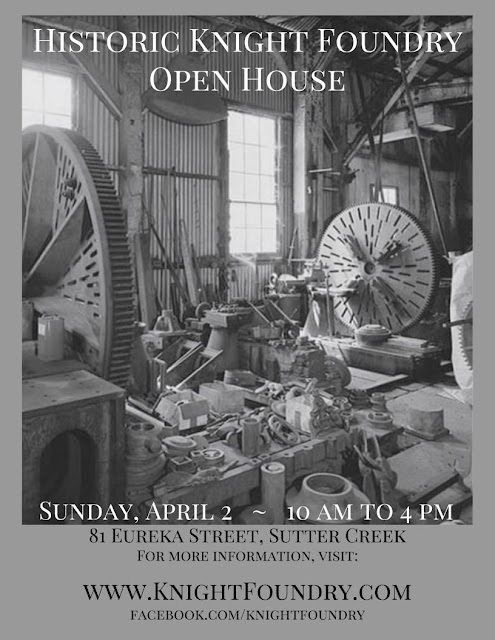 Everyone is welcome to attend their Open House on Sunday, April 2, from 10am to 4pm, 81 Eureka Street, Sutter Creek. Meet local historians and former Foundry employees, view demonstrations of how the wheels turned, and discover the compelling history that is historic Knight Foundry. The event is free.